Getting married soon? No doubt you have made all the necessary arrangements regarding flowers, catering, decorations, the venue, time, how many people you want to invite, and so on. Undoubtedly, you want nothing to go wrong on your special day. As it relates to decorations though, have you considered what you are going to use as centerpieces on the tables? The new craze right now are ostrich feathers. They look beautiful when lights are placed around them or through them and add a touch of elegance to the entire decor. 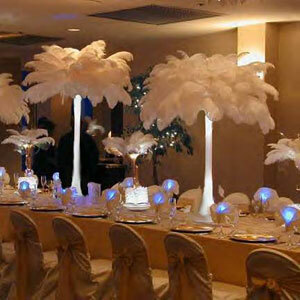 Wholesale Event Solutions has ostrich feather centerpieces at affordable prices. They even have them in different colors, based on your choice. The ostrich feather centerpieces kit has 12 White 24″ Eiffel Tower Vases, 13-16″ white Ostrich Drabs, 24 Floralytes which can have customized colors, and 12 Foam Bouquet Holders to hold the feathers in place. The kits, once purchased, are usually available within 7 to 10 business days, but allow 2 to 3 weeks for delivery. So if you want to include ostrich feather centerpieces as part of your wedding decorations, make your order now from the Wholesale Event Solutions website. Your guests will love them and your special day will be just perfect.